This list uncovers some amazing feats in architecture and technology, one of which has taken at least a decade to create. The building of all these structures was a major undertaking which is still taking a toll on some property developers and investors. Some of these sites are stunning and remarkable while others are slightly humorous. It’s beyond amazing to see the painstaking efforts some individuals have taken to recreate history. We’re talking about history buffs who are so aroused by creating replicas that they will spend their family’s fortune to recreate the history of another country inside their own. If you’re in China but love Paris and luxury, you should visit Tianducheng. You’ll have the ability to have it all to yourself because the area is largely abandoned. The area impressively replicates Paris—from the buildings surrounding the 108-meter (354 ft) replica of the Eiffel Tower to the Champs-Elysees’ fountain. The replica is a sight to behold even though it’s less than half of the real size, actually closer to a third. 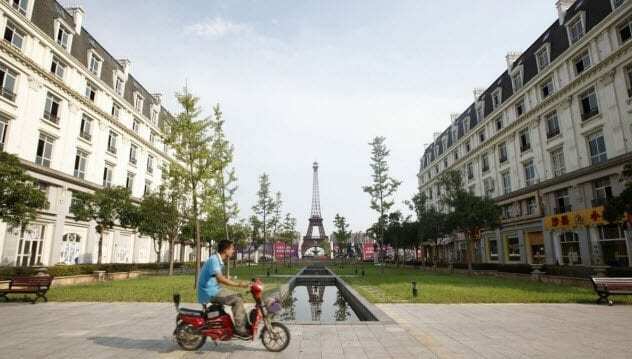 Paris in Tianducheng has a residential neighborhood around the Eiffel Tower, a gated community that protects practically no one. It is built to accommodate 10,000 people, but far fewer people than that live there. Travel time to get there by public transportation takes at least an hour. Perhaps this is the reason for the lack of incoming traffic in the area despite its allure to investors. If an English person finds their trip to China culturally shocking, they can take solace in the faux English replicas. 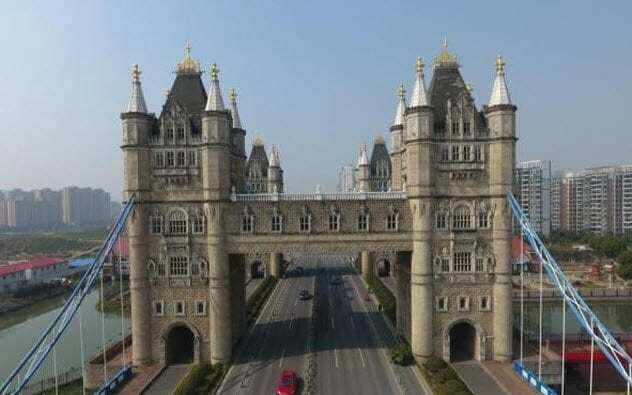 Those with an eye for authenticity will notice that the Tower Bridge in Suzhou does not have a raising mechanism. The original has two towers while the replica has four towers connected through skywalks and elevators. You’ll find Tower Bridge Coffee located in one of the towers. Humorously enough, it has an English cafe with a Chinese menu. The Chinese are proud of the £9.4 million monument, which stands 40 meters (131 ft) tall, across Huayuan Road. A Chinese publication stated that the Chinese structure was more magnificent than the original. The replica is wider at the base and has space for pedestrians and non–motor vehicles on either side. The bridge is still discussed as part of the controversial urban planning in Suzhou that focuses on erecting foreign structures. The president of an architecture firm in Beijing called the bridge plagiarism in a city that already has its own rich culture. 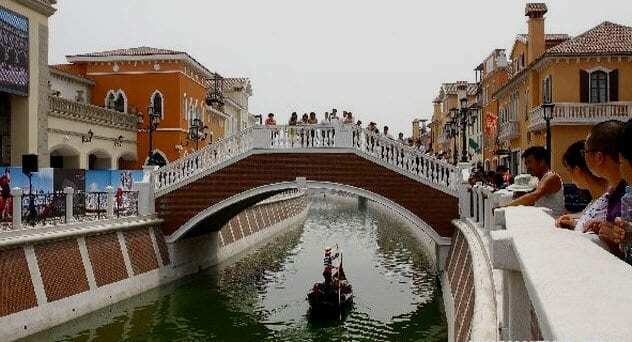 Florentia Village is a great place to visit if you have a taste for pricey Italian dining and shopping in Tianjin. This shopping center is definitely an Italian knockoff. But no matter how fake it might be, shoppers should be strapped with real, cold, hard cash. This $220 million investment is nothing to be scoffed at. No need to take an 18-hour flight to shell out dollars the Italian way. When most people think of picking a gondola and riding down the canal, China is probably not the first place that comes to mind. It’s fascinating that expensive brands such as Armani, Prada, Versace, and more have placed their shops in a replica shopping center. Wouldn’t one think that the world’s most successful retail brands would want to be associated with authenticity instead of a fictitious area of “Italy”? Guess not. If a picture is taken at just the right angle, who is to say it’s not authentic? Italian mall operator RDM is expecting a lot of mainlander and international business. Faux Italy is located near the Kwai Hing subway station. Since it’s close to immigration checkpoints, the airport, and the subway, approximately half a million visitors are expected to travel to Florentia Village. Great minds at Harvard University, Dassault Systemes, and the Museum of Fine Arts in Boston have collaborated to make an impressive replica of an Egyptian 3-D world. Professor Peter Der Manuelian has used 3-D immersion in his teaching for the last 10 years. Recreations include 3-D tours of major monuments of Giza—three pyramids, the sphinx, 15 tombs, and the throne of the mother of King Khufu. Dassault Systemes and the Harvard Semitic Museum have been collaborating for six years to create tombs and pyramids. The duo worked to provide 3-D, immersive classrooms for students to learn about the Giza area. High-performance projectors and a wide, curved screen provide a fully immersive experience for students learning about the structures of ancient Egypt. The project is focused on archaeological truths to ensure historical accuracy. It brings together the findings of 11 different universities located in the US, Egypt, Austria, Germany, and Italy. The Giza Pyramids in 3-D contains 150,000 files with information dating back to the 1800s. 3-D technology allows the Giza plateau to be shown at three different periods in time simultaneously. This includes the pyramids in 2400 BC, the conditions in 1912, and the structures as they are today. 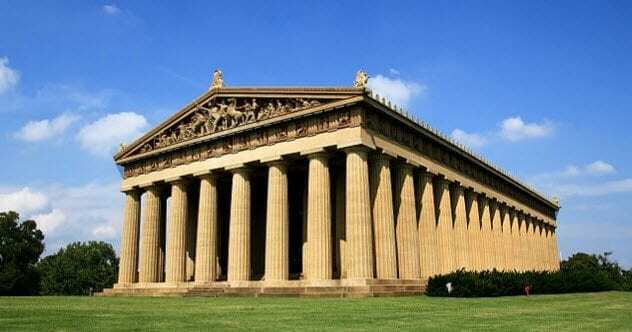 Witnessing the replica of Greece’s Parthenon in Tennessee isn’t free. Even though this historic building is fake and completely out of place, the original casts for the marble sculptures are authentic and date back to 438 BC. Other than being made of plaster, these full-scale replicas are remarkable. The Centennial Exposition of 1897 brought about the creation of the Parthenon replica. However, the whole point of the Centennial Exposition was to display Native Americans, the original inhabitants of the land. Nevertheless, the choice was made to honor the original Native American tribes with something that has nothing to do with their culture or history. The 13-meter (42 ft) statue of Athena Parthenos (“Athena the Virgin”) also serves as a museum of art. The Parthenon was made for temporary display in 1895 for the Tennessee Centennial Exposition in 1897, although the state decided to make the structure permanent in 1920. The statue of Athena Parthenos is the largest indoor statue in the Western world. The statue remained completely white for 12 years before it underwent a four-month gilding process. Pheidias, the original Greek sculptor of Athena, was also the creator of the statue of Zeus at Olympia, one of the Seven Wonders of the World. Alan LeQuire won the commission to recreate Athena Parthenos in 1982, and the work was finally unveiled in 1990. In the 1920s, Robert Ilg got an idea that he wanted to construct a 22-acre park in Illinois with two swimming pools. But he was confronted with the issue of unsightly water towers which provided water for the pools. 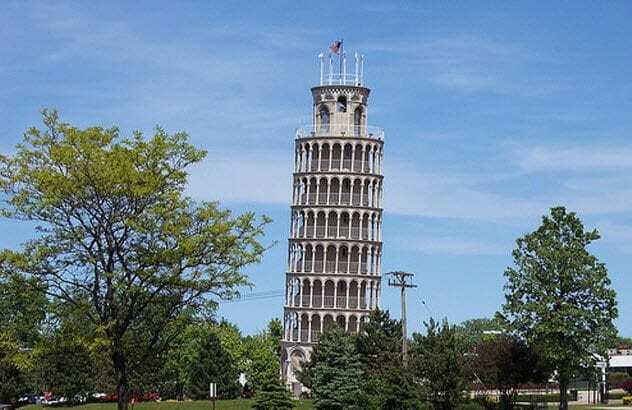 Then an ingenious idea popped into his mind to develop a replica of the “Leaning Tower of Pisa” to hide the water tanks. Size apparently doesn’t matter. At 29 meters (94 ft) tall, this replica is half the size of the original in Pisa, Italy. Ilg required the local YMCA (which inherited the building) to maintain the site for $500 per year until 2059. The structure needs repairs, so hopefully, there are enough funds to complete the job. These days, you just can’t count on landmarks to tell you where you are. Seeing the Statue of Liberty no longer means you’re in New York. 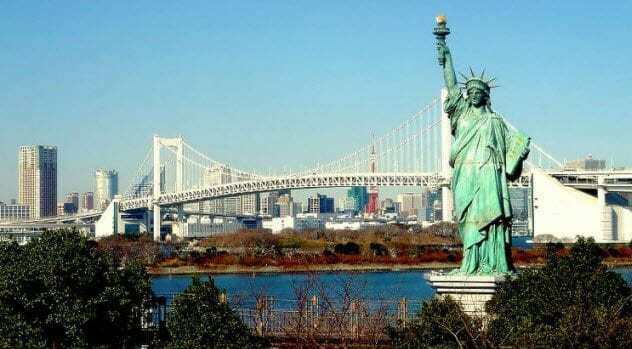 In fact, there are three replicas of this well-known monument in Japan—one each in Odaiba, Shimoda, and Osaka. The figure was provided on loan from France and temporarily put in place for a year in 1998 to celebrate ties between Japan and France. The following year, France took back the statue. What better way to replace something missed than to just make a fake one? In 2000, a replica was erected in Japan and remains to this day. 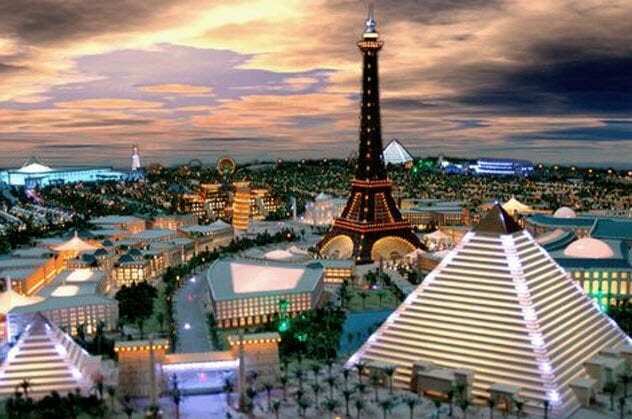 The Seven Wonders of the World are set to be recreated in Falconcity of Wonders in Dubai. The city is host to replicas of the pyramids, Taj Arabia, Tower of Pisa, Hanging Gardens of Babylon, the Eiffel Tower, and the Great Wall of China. Taj Arabia is a replica of the Taj Mahal. The construction places heavy emphasis on modern amenities. The Hanging Gardens of Babylon in Dubai offer eco-friendly luxury flats, open-air restaurants, and of course, the garden. Despite the immense efforts to recreate these structures, the focus is not on historical accuracy as much as aesthetic appeal. Many of the replicas have features that cannot be found on the originals, such as parks, cafes, and fountains. The luxury community is still in the process of being built after many years of delays. Who would have known that it’s such a popular idea to live in a house that’s modeled after the Flintstones’ home? A theme park spanning six acres is dedicated to Fred and his lifestyle. It sits 48 kilometers (30 mi) outside of the Grand Canyon’s south rim. The park is one of a few different Flintstones-themed parks in the US. 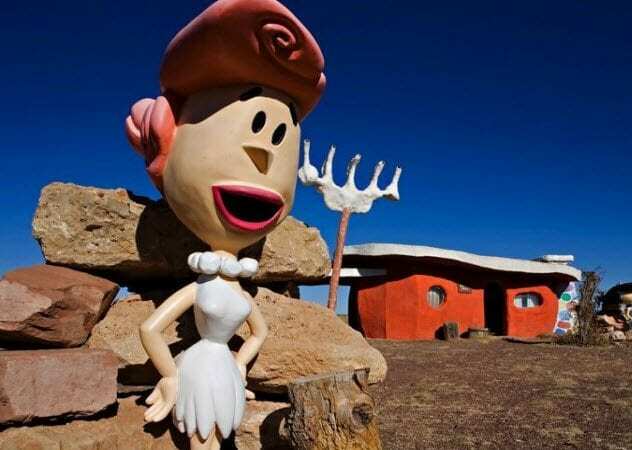 The Flintstones’ Bedrock City Park and Campground is a theme park with quirky features, like a cafe with coffee for five cents and a fake volcano named after Wilma. The town is complete with all the buildings—a dentist’s office, post office, jail, police station, and gift shop. Visit Fred’s Diner and chow down on the cartoon character’s favorite meals, like the Fishasaurus sandwich, Chickasaurus dinner, Bronto burgers, and Gravelberry pie. For many years, the park was home to Linda Speckels, her five daughters, and her late husband, Francis. She is now looking for someone to take over the park’s operations as she’s raised all her children at the park and is ready to move on. Speckels hopes that the new owner of the property will continue the Flintstones theme, but she is okay if they decide not to. Unfortunately for the new owner, the Hanna-Barbera licensing rights don’t transfer with the sale, but the conditional use permit does. The new owner will have options to convert the property into a mall or casino. Anyone who opposes destruction of the park can slide down the back of their own brontosaurus every day for $2 million. The Titanic II is being created by billionaire Clive Palmer. 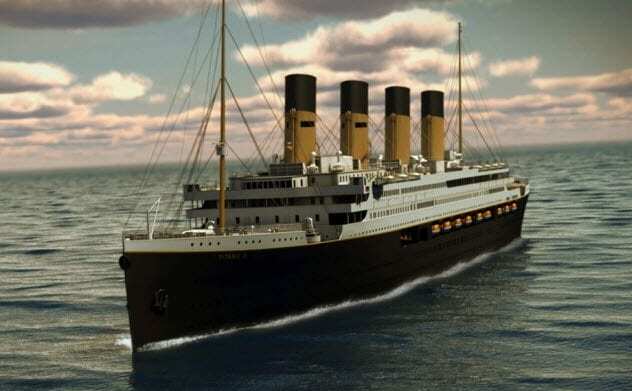 The design and decor of Titanic II will match the era of its predecessor. The replica of the iconic ship will even contain replicas of the original lifeboats. The hull has finally been completed on this functioning replica of the Titanic after two years of delays. Plans were developed in 2012, and the ship was scheduled to have its maiden voyage in 2016. But that has been delayed until 2018. Made for 2,435 passengers, the new ship will be equipped with lifeboats and modern marine applications. Even though Titanic II is slated to have 840 rooms and nine decks, it is actually going to be smaller than modern-day cruise ships. The cost to build it is estimated at $435 million, roughly 10 times the cost of the original. It will be permanently docked at a luxury resort, set to open at the end of 2017. Titanic II will not be taking its old route. Instead, it will travel from Jiangsu, China, to Dubai. Katana Haley is an entrepreneur and woman of many hats. When she’s not performing hard rock or songwriting, you’ll find her in a book. She has an extensive content marketing, copywriting, and musical background. Katana’s experience includes being a singer, content marketer, and web developer.